I’m yet to meet a traveller to Mexico who doesn’t like it. It’s an incredible country, absolutely packed with an enthralling and encapsulating culture. But it’s not just the culture that draws tourists into Mexico: it has amazing nature, delicious food and plenty of parties. Seriously, there are so many things to do in Mexico that ticking off everything on your Mexico bucket list might take years. 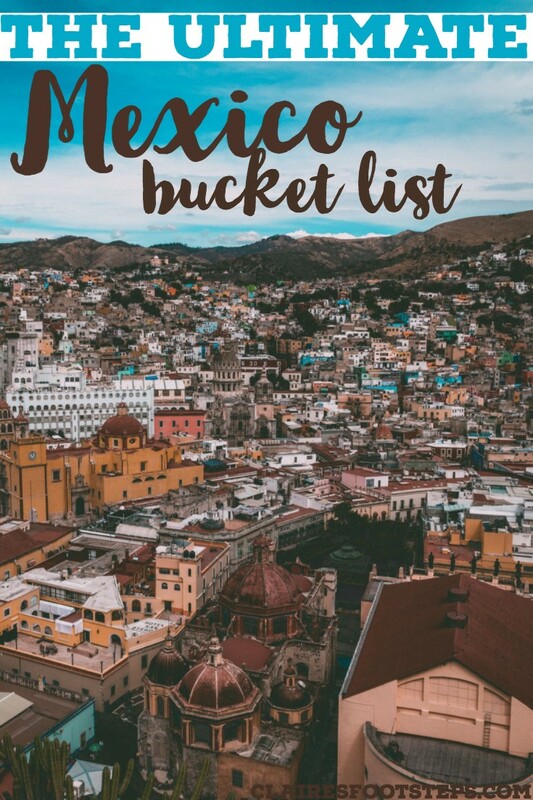 I’d love to put thousands of things on this list of things to do in Mexico – but I want to make it manageable for you, so I’m limiting it to X. This Mexico bucket list intertwines the country’s amazing nature, indigenous heritage, food and art scene, and love of sport. 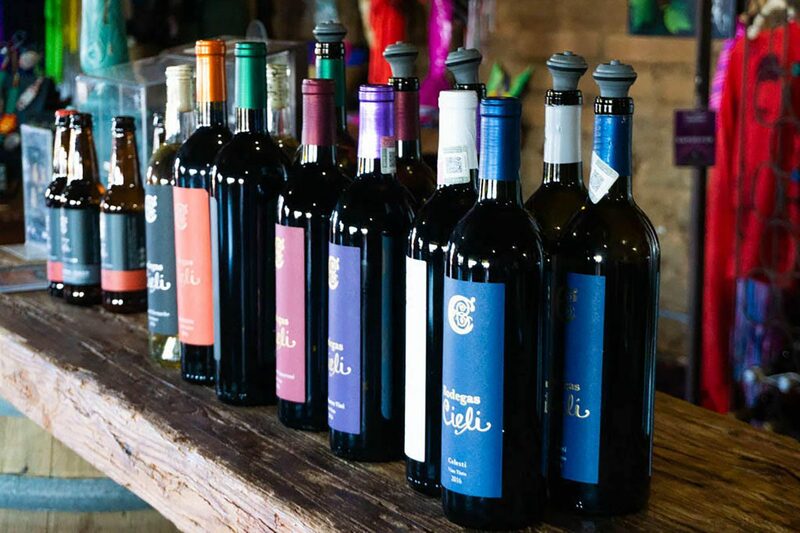 Mexico’s Valle de Gudalupe, just a two hour drive south from San Diego, offers wine tasters more than 75 wineries and dozens of varietals to choose from on the Ruta del Vino. This is off-the-beaten path Mexico at its finest: Travel down little dirt roads to world-class restaurants and wineries built by renowned Mexican architects. The best wineries in Valle de Guadalupe range from established mega wineries making wines for 30 years to boutique upstarts with Instagrammable rooftop bars and open air restaurants. Likewise, choose from inexpensive but gourmet food trucks or reserve a four course wine and food pairing designed by a world-class chef. Mexico is one of the leading countries in ocean conservation efforts, and you can look no further than the northeastern part of Mexico: Baja, California. Here, in between the mainland and the peninsula, lies the Sea of Cortez. Often called the “Aquarium of the World” due to its marine diversity, the Sea of Cortez is an incredible place to explore. 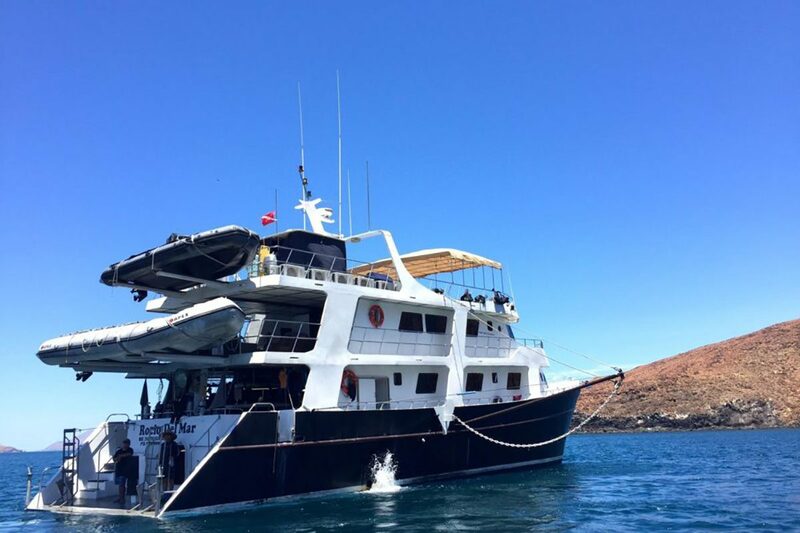 One of the best ways to do that is by booking a trip on the Rocio del Mar liveaboard – an excellent scuba program that will change the way you look at diving in North America. The diversity of marine life here is overwhelming – you can find anything from massive whale sharks and sperm whales to tiny slug-like creatures called nudibranchs. The gem of the area is the Revillagigedo Archipelago, which was recently added as a UNESCO Heritage Site. Contrary to the party central and beach focused Los Cabos, quieter sister San Jose is a much more tamed down version which favors art and craft over masses of Spring Break travelers. In the main street and bear the historical church of this cobblestoned city you can find lots of galleries and artist studios providing an insight into Mexico‘s rich heritage through art. There are sculptures, paintings, installations, photography and any other form of artistic expression on display. The area also has several restaurants, bars and cafes, some of which selling handmade items and organic food to go along with artistic exploration. The best way to discover the many galleries is on foot as the street is small and convenient, and possibly, one one of the evening art walks organised from November to June on Thursday evening. The most important museum in the north of the country, this exhibition details life in Mexico from pre-Hispanic days to the twentieth century. If you want to learn about the history of the country in great detail, this Monerrey museum is your place. It doesn’t sound all that exciting, but the interactive museum of Horno 3 is one of the best things to do in Monterrey and is a must on your Mexican bucket list. It’s less of a museum and more of an interactive science centre, with lots of details about how steel is made and how pivotal it is to Mexico to this day. Enjoy the history gallery, the the steel gallery, an oven show and a great documentary within the museum. Zacatecas is the most northern of Mexico´s silver cities; despite its wealth of attractions, it receives few foreign visitors. Its beautiful colonial center, a UNESCO World Heritage site, is stunningly illuminated at night. The majestic cathedral is renowned for its elaborate baroque architecture. 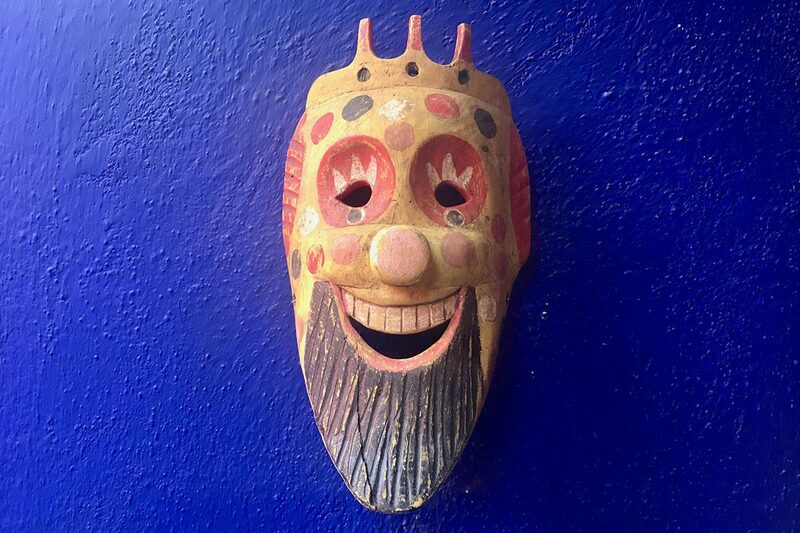 Other top sights include the Museo Pedro Coronel, which exhibits modern art and pre-Hispanic artifacts, as well as the Museo Rafael Coronel, which houses a fascinating collection of traditional masks and puppets. La Bufa hill offers fantastic panoramas of the city. Don’t miss a tour of El Edén, a fabulously wealthy 16th-century mine that now contains an underground disco. One of the most important mines in Mexico is located in Mina El Eden. This is a very historically significant place, that details how much wealth lay underneath the country – and the awful conditions that slaves (generally indigenous people) had to work in for the rich to access the wealth. It’s a dark part of Mexico’s history, but is important for people to know about today. Nowadays, tourists can descend into the mine via miniature train and see the mine first-hand with a guide. Taking the train in northern Mexico should be a bucket list experience for any keen Latin American traveller. It’s one of the only rail routes in the country, and it’s a great one. There are two trains that you can take; one is the longer, orignal train and one is a more touristy version. It takes either nine or sixteen hours. But you’ll want to get off and actually explore the canyon, which is larger and deeper than the Grand Canyon in its northern neighbour and is a UNESCO world heritage site. This could take a few days. Read more tips for riding the Copper Canyon train here. In European cultures we typically shy away from death, but Mexico embraces it well as a part of life that’s unavoidable for everyone. This is shown through Day of the Dead, and also through the Museum of Death in Aguascalientes. It was started as a way to display the hundreds of artefacts about death that the city’s university had collected over the years. However, it now explores the interesting relationship that Mexico has with death, from the pre-Hispanic era to modern day. It features ancient traditions around Day of the Dead, the popularity of sugar skulls in modern culture, and everything in between! A garden created in the rainforest of Mexico’s Sierra Madres, the beautiful structures of Las Pozas was created by British poet Edward James. They’re a surrealist work of art; different sculptures, towers and other forms of artwork come together to create something really extraordinary. curated an assortment of over 500 masks, many of which have been collected from indigenous people throughout the country. Masks ranging from human forms to animal heads adorn the walls of the museum. Another item of note is that every mask throughout the museum has been utilized in a ceremonial dance, which qualifies them as being authentic and collectible. 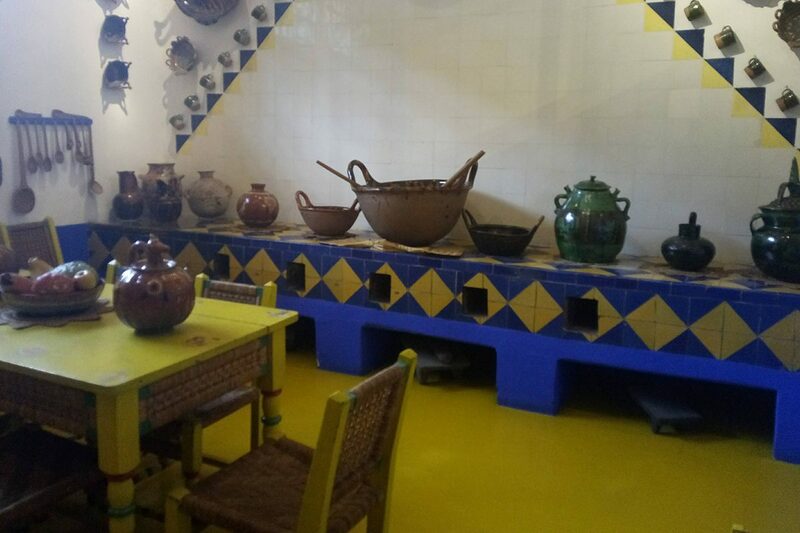 Although it’s a bit off the beaten path, this colorful museum is worth the stop in order to take a peek into the rich history of Mexico. 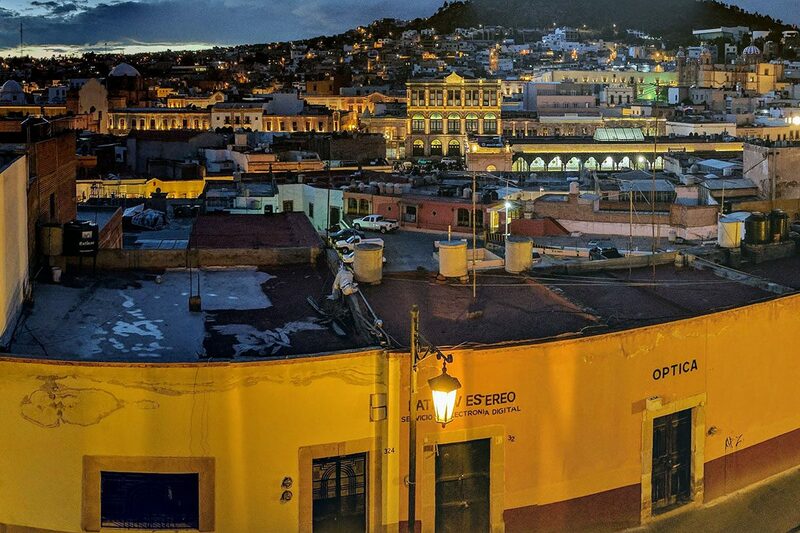 I don’t need to tell you that Guanajuato is a must-visit city in Mexico. 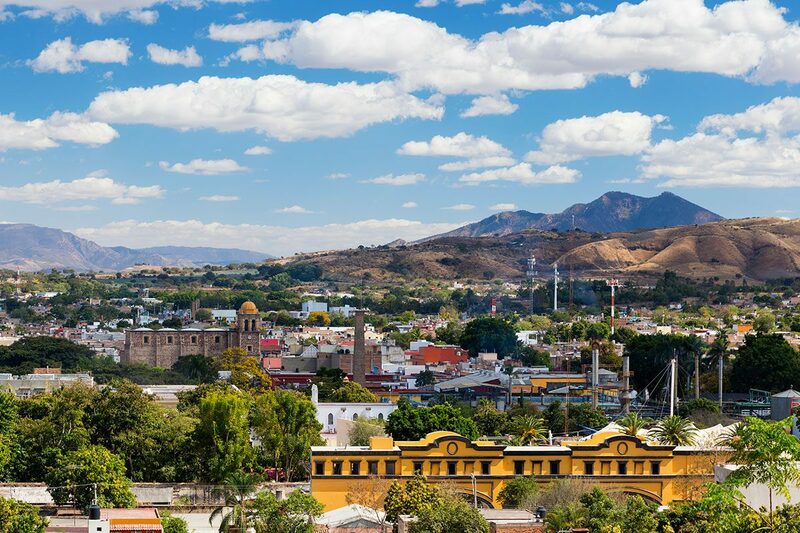 With its cobbled streets and charming old buildings, it’s one of the best examples of Mexican towns and their beauty. But one of the Mexico bucket list activities that should make it onto this list is Pipila, the best viewpoint in the city. Not only does the memorial dedicate itself to Pipila, a heroic miner during the Mexican War of Indepedence, but it’s home to the best view in town. So once you’ve explored the narrow alleyways of Guanajuato centre, head up to this vantage point for another perspective of the city. Like most viewpoints, it’s an uphill hike to reach here (funny how that works, isn’t it?). While it’s not too challenging, some people may prefer to take a taxi up there instead – which is completely possible. 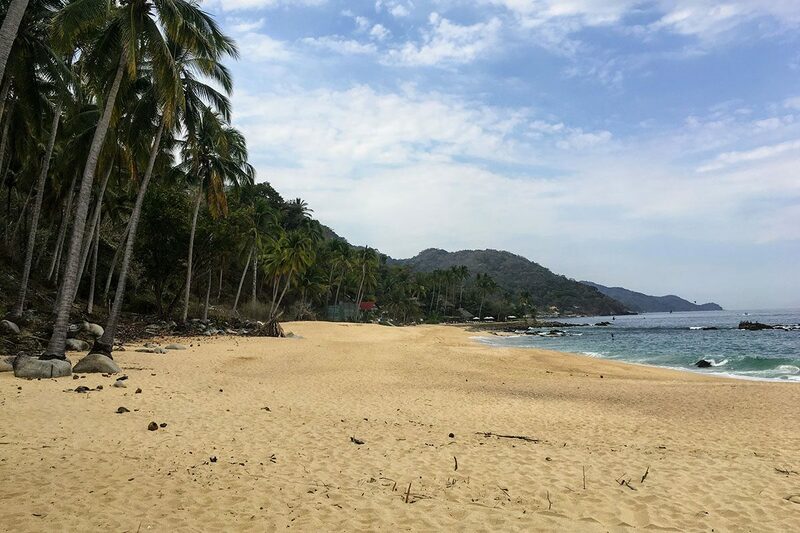 Just south of Puerto Vallarta, go hiking along a quiet trail that begins in Boca de Tomatlan and ends at Playa Las Animas; a beautiful beach where you’ll find a small fishing community. You’ll enjoy sweeping views of the ocean where the Sierra Madre mountain range meets the sea. Along the way, you’ll pass by deserted beaches. Don’t forget to turn and enjoy the views of the city behind you. Stop and take a dip in the crystal clear waters while watching the wildlife around you. This moderate hike takes just over two hours and you can reward yourself with a tasty margarita and a sun lounger upon your arrival at Playa Las Animas. Panteón de Belén is a 19th century cemetery located in the heart of Guadalajara – the capital of Jalisco, and Mexico’s second largest city. The tombs have been relocated to a different graveyard, but nowadays it stands as a museum, which details its eerie ghost sightings and the grandeur of the buildings and gravestones. The night tours are very popular. I don’t even like Tequila, but I’d love a ride on the Tequila Express. 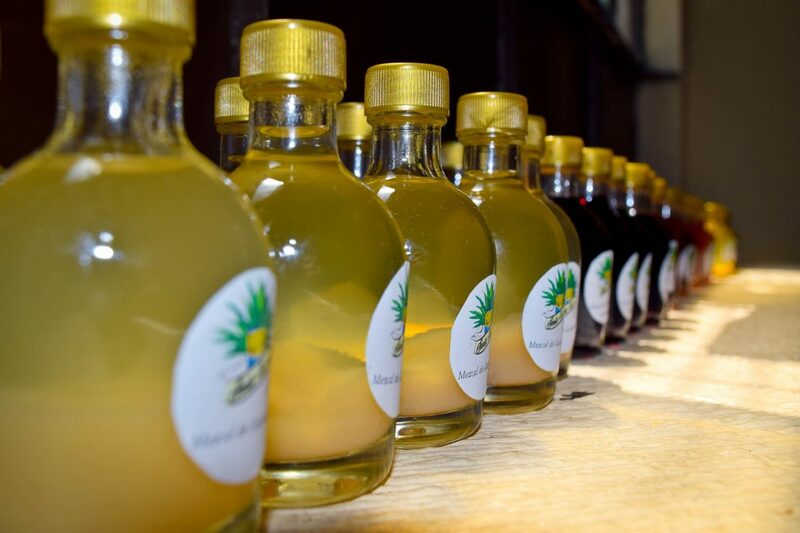 The Jose Cuervo is the most common one of these – it’s a two hour journey from Guadalajara to the town of Tequila – where tequila was invented! The train has three tiers, and it’s worth splashing out on the premium plus cabin. 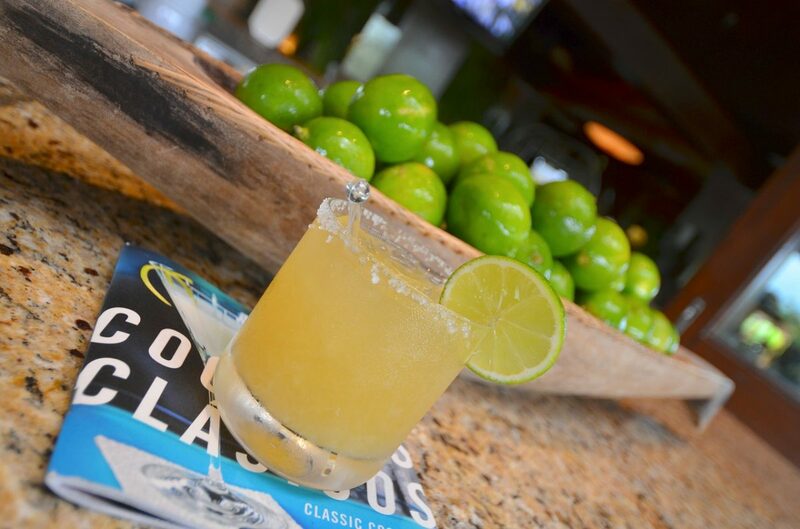 There are, of course, tequila cocktails aplenty. The Tequila Herradura Express also operates, with slightly cheaper rates, and also serves up tequila cocktails in a similar setting. Once you’re there, make sure you spend some time seeing the charming town of tequila, which is one of Mexico’s Pueblos Magicos. 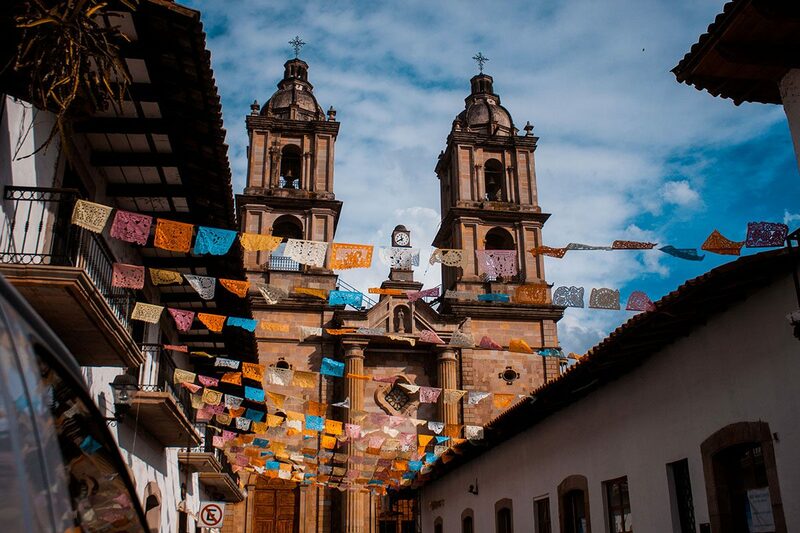 Wander the cobbled streets, admire the old buildings and drink as much tequila as you can handle! 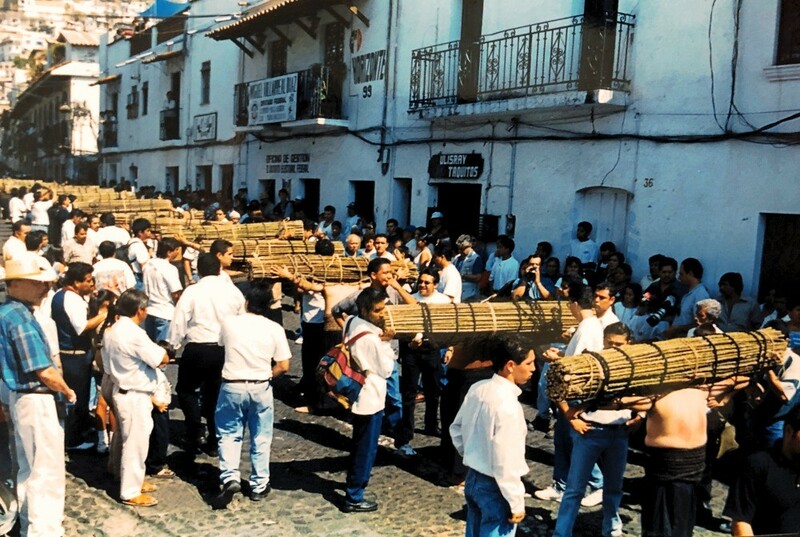 Celebrating Semana Santa (Holy Week) in Taxco should be on everyone’s Mexico bucket list. Semana Santa celebrations are unique here. Every day from Palm Sunday to Good Friday, nightly processions slowly wind through the steep, narrow streets. Statues of Jesus are carried through town on Palm Sunday, surrounded by hundreds of people carrying ornaments of Jesus woven from palm fronds and flowers. Then each day or night, dozens and dozens of hooded penitents shuffle through town, bearing heavy loads of thorny sticks, bent double dragging heavy chains or striking their backs with sharp thorns in a gruesome and eerie display of faith and penitence. Veiled women and girls accompany them, waving incense and carrying lit candles. You will be transported back into another century, as these age-old traditions of palms and pain are kept alive each Easter in this tiny hillside town southwest of the capital. There have been folk tales about tunnels underneath the streets of Mexican cities for centuries. Recently, one of them turned out to be true – in 2016 a network of passageways were discovered underneath the city of Puebla. The tunnel system dates back to 1531 and opens up to the Loreto Fort, where the Cinco de Mayo battle happened. Weaponary – as well as toys and kitchenware – was found in the tunnels. It is believed that the weaponary dated back to the mid-19th century, which is when the Battle of Puebla between Mexico and France took place. It is believed, therefore, that the tunnels were used by soldiers. Visitors can take a tour to learn about the stories that the historians have uncovered, so far, and the significance of the tunnels on modern day Puebla. 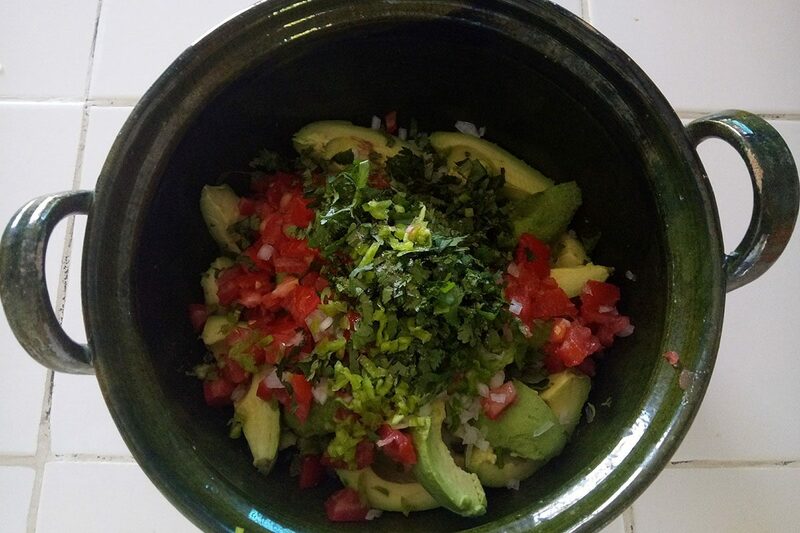 Mexico is well-known for its food, but the actual food that you’ll eat in Mexico is so different from Mexican food you’ll be used to. Fajitas don’t exist, tacos look completely different and nachos loaded with cheddar cheese are a sin. A food tour in Mexico City is the best way to see the cusine of the country; there are tours for every palate. 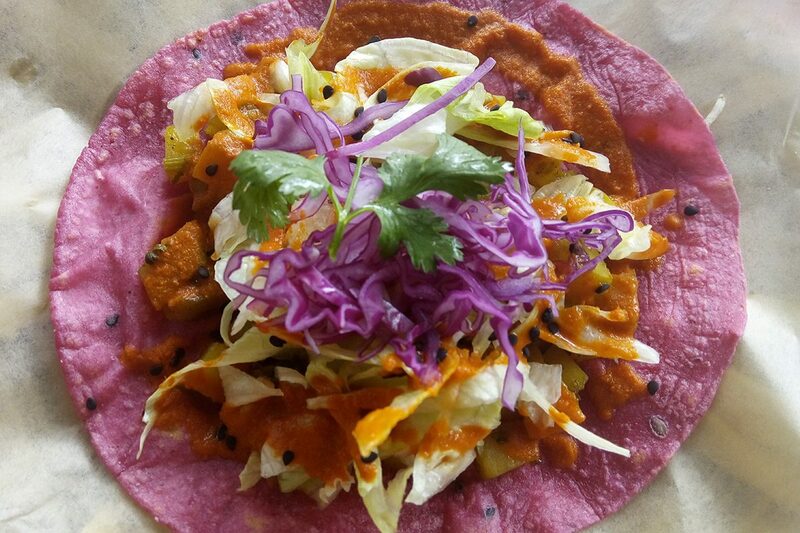 If you’re vegetarian or vegan, there’s no better place to enjoy adapted Mexican food. I took this great vegan food tour in Roma which took me around the best spots to get vegan tacos and more in the city. Mexico City’s Centre is full of interesting old buildings, many oozing with character and telling how the magnificent city came to be as it is today. It’s best to enjoy the sights on a walking tour – a guide will tell you everything you need to know about the most famous spots of the area and its rich and diverse history. I took a free walking tour (tips expected) and it was a great way to learn more about the city. 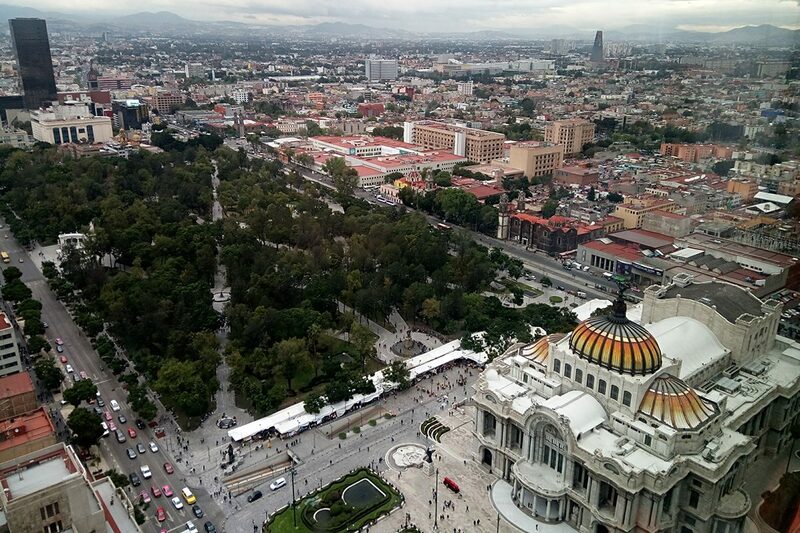 Condesa is one of the most fun spots in Mexico City, and is a thriving nightlife destination. As well as being full of great bars and clubs, it’s also one of the safest areas of the city. Check out Condesa DF for views of the neighbourhood, Artic Bar for the first ice bar in Latin America, have cocktails at Baltra Bar and head to Leonor for dance anthems. 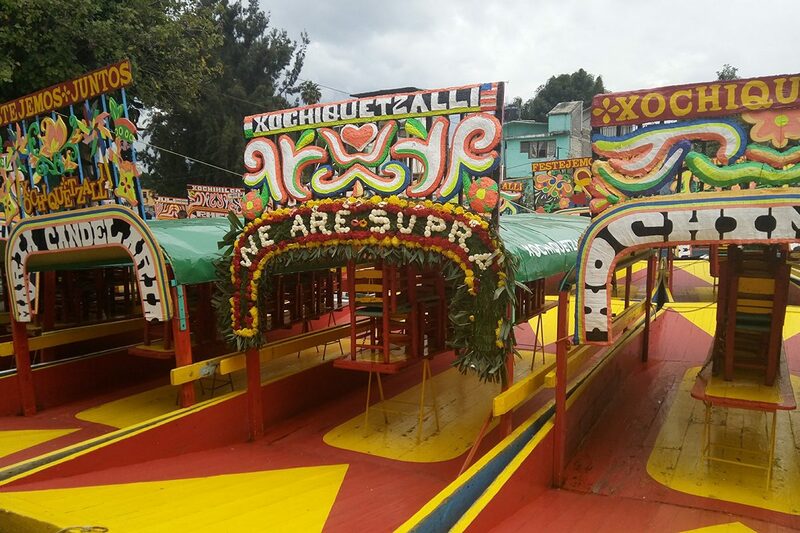 The network of canals and floating gardens in Xochimilco are great for a relaxing afternoon on the river; there are plenty of photo opportunities and spots to learn about the area’s heritage. Don’t miss the island of the dolls – a spooky reaction within Xochimilco’s canals and one of the most photographed places in Mexico City. One of the most famous Mexicans to exist, Frida Kahlo is a legendary artist and feminist icon. 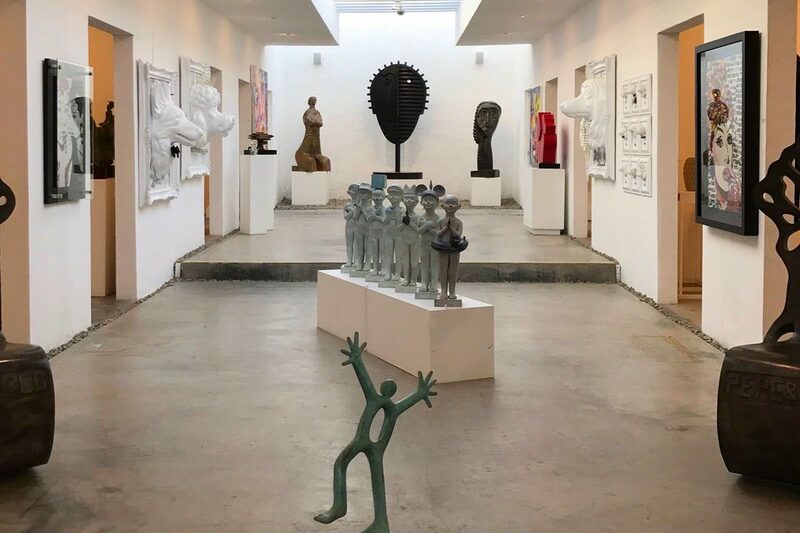 Her house in Coyoacán in Mexico City is open for guests (it’s best to book your time online by clicking here) and is full with her art and models that reflect her personality. Lucha Libre is the Mexican equivalent of WWE wrestling, but way better! Watching a Lucha Libre match in Mexico City is an experience I’ll never forget. Masked fighters wearing colourful spandex leap around the ring in a spectacular demonstration of athleticism and showmanship, to the sound of hundreds of Mexican spectators yelling support and abuse at their favourite performers. 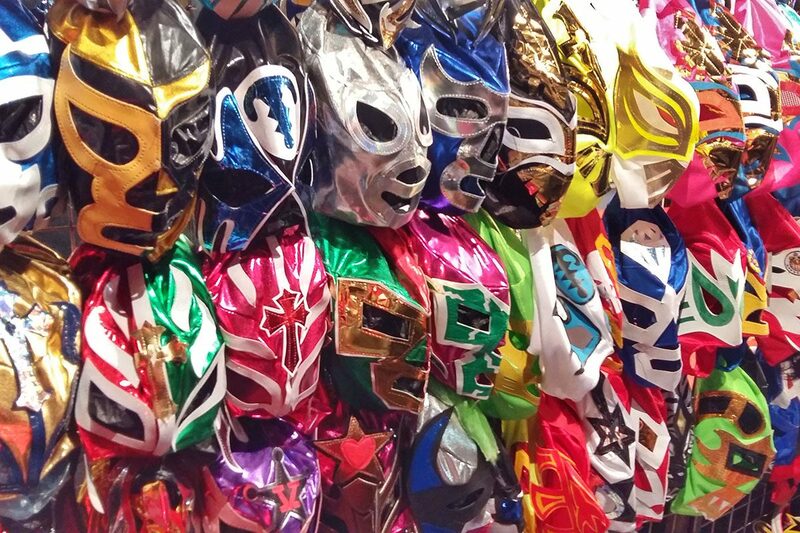 It is great fun to go and watch (especially after a few drinks), and you can even buy your own Lucha Libre mask and emulate your favourite luchador. I wasn’t sure what to expect, but go with an open mind and a sense of fun and you can’t help but enjoy this blend of colourful action and acting! One of the best things to do in Mexico City is without a doubt the Anthropology Museum; it is the largest and most visited museum in the country, and will take you the best part of a day to get around. Many of the collections focus on Indigenous Mexicans, displaying life in pre-Hispanic Mexico and how natives live today. It expertly details how Mexican culture has had influences from the pre-Hispanic era through the mediums of art, writing and historical artefacts. Free guided tours take place, and all the information is written in English and Spanish. 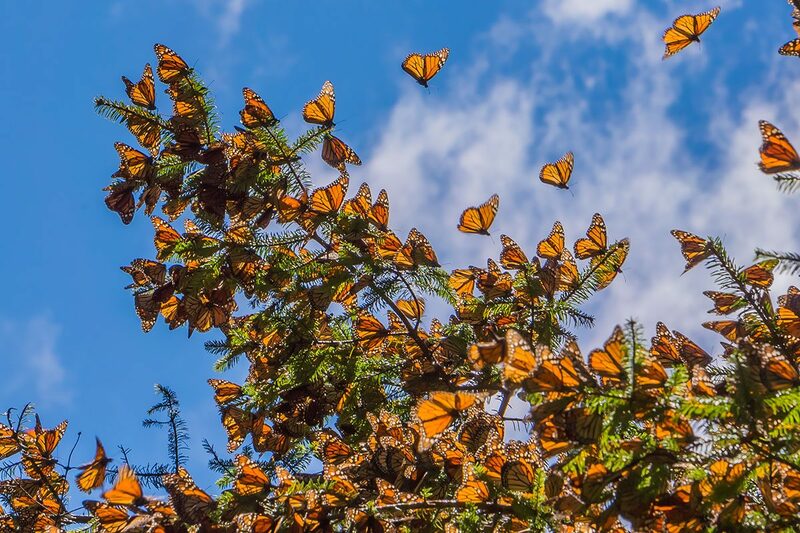 The UNESCO World Heritage Site of the Monarch Butterfly Reserve is a protected area that hundreds of millions of monarch butterflies call home during the winter months. They travel here fromthe USA and Canada when the colder weather sets in, flying some 3000 miles or over 4800 kilometres to reach this site in Central Mexico. They stay here all winter and return to the same spot every year. Exactly how they do this is a mystery. Tourists can see the butterflies in certain places of the protected area. It’s possible to do as a day trip from Mexico City, or an overnight trip with a stay in Angangueo. 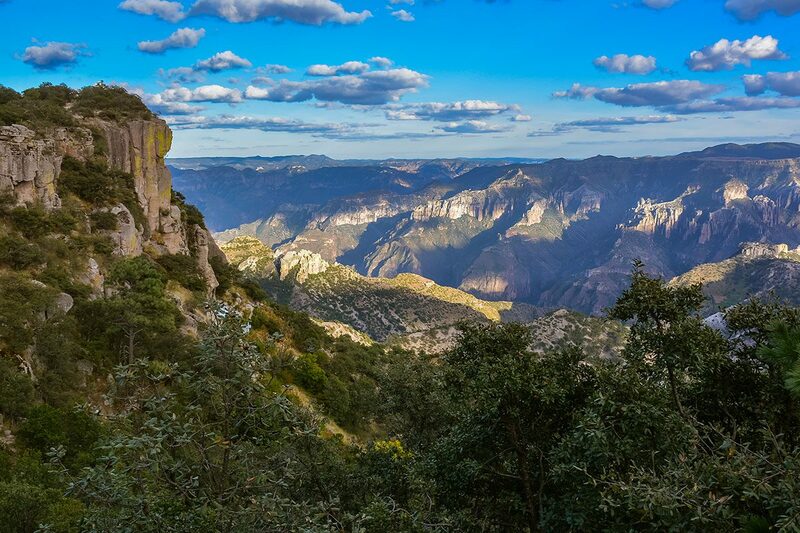 This national park is close to Mexico City, and makes an easy day trip from the capital. 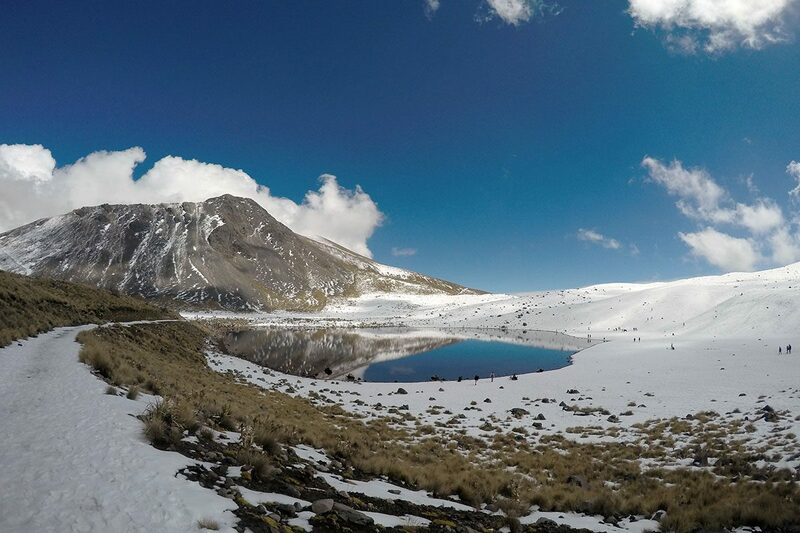 People come here to hike, see the famous craters and have the chance of seeing snow in Mexico – which is common during the cold winter months. It’s the fourth highest peak in Mexico and it is relatively easy to ascend to the summit. Be sure to pack warm clothes – it’s much colder here than Mexico City! These Mexican pyramids could give Cairo a run for its money. Its a UNESCO world heritage site and has 2,000 years of history; they were part of what was once Mesoamerica’s greatest city. 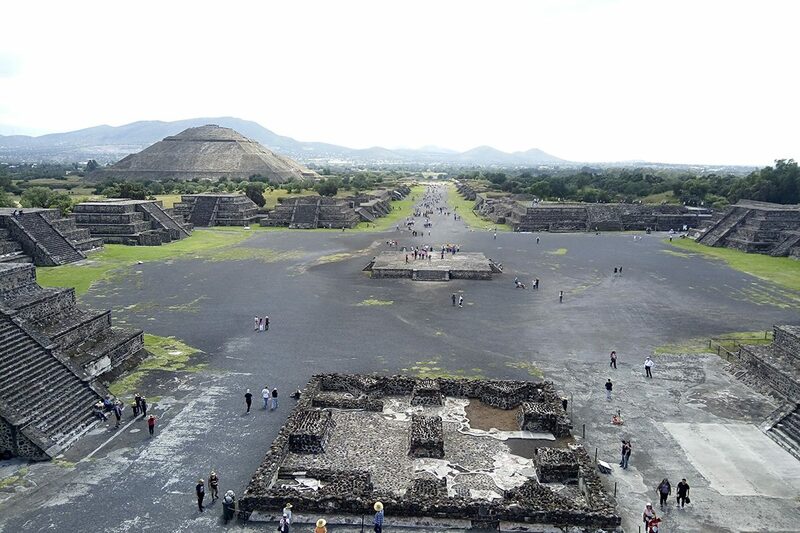 You can climb up both the Pyramid of the Sun and the Pyramid of the Moon and explore lots of ruins. It’s best to hire a local guide (English speaking guides are available) to really get to grips with the history of this impressive attraction. 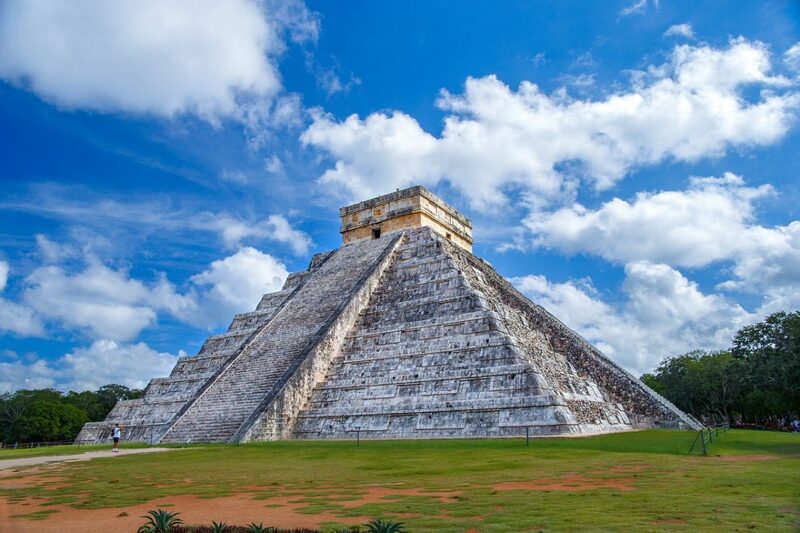 One of the New Seven Wonders of the World is the old Mayan complex of Chichen Itza. This UNESCO World Heritage Site is certainly no secret but should definitely make it on your list of places to visit in Mexico, particularly if you’re already in Cancun or Tulum as it’s only a couple of hours away. El Castillo (The Castle) steals the show as its a remarkably intact temple-pyramid but there are tons of other structures in the complex. As with most well-known spots, getting here early and not on a tour is your best bet. Simply rent a car and get here early to avoid the throngs of tour buses flooding in before lunch. 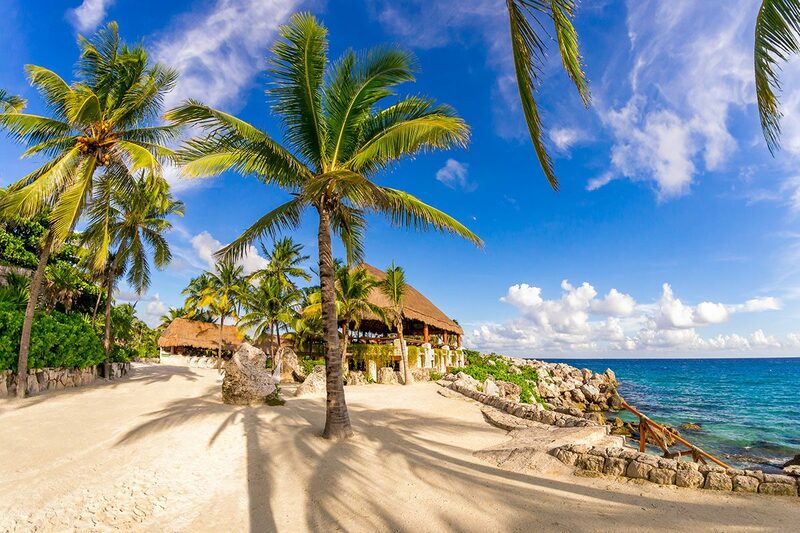 Cozumel is a small tropical island off the Yucatan peninsula. Most know it for its white sand beaches and world class diving. A lesser known, but equally worthwhile activity is to bicycle around the entire island. The 65km trail is mostly paved, flat, and can easily be accomplished in a day with time for sightseeing, relaxing on the public beaches of the Eastern shore, and a leisurely lunch. 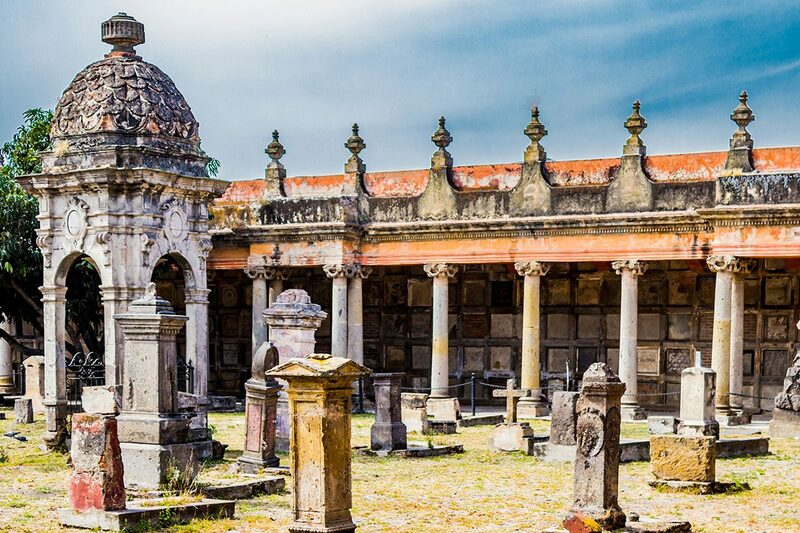 With a small detour you can take in the ancient San Gervasio ruins. 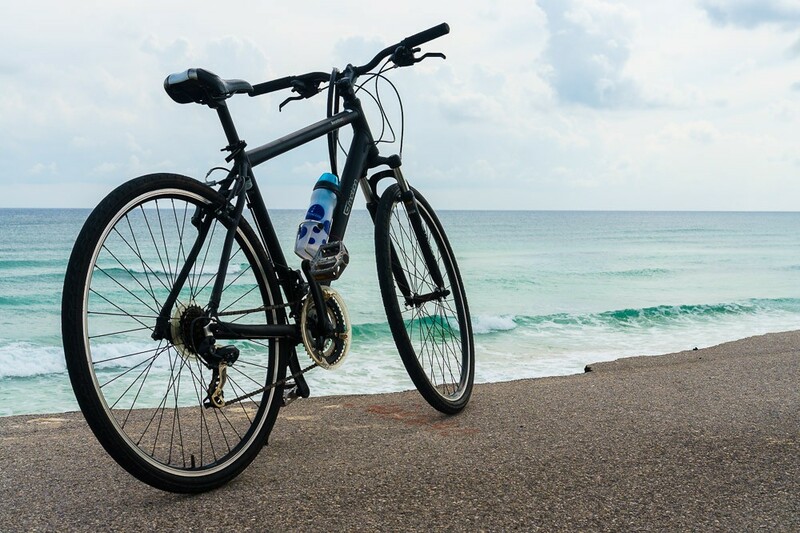 Cycling in Cozumel is the perfect way to take in the relaxing island vibe of Cozumel. 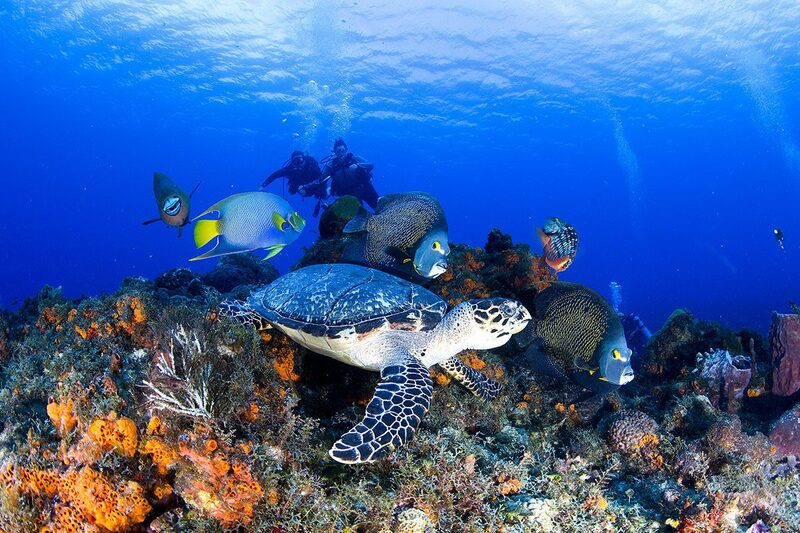 One of the best spots for scuba diving has to be the Cozumel Reefs National Marine Park, Mexico. Cozumel is famous within the scuba community and it’s easy to see why: over 100 different coral, lush walls, intricate caverns, plentiful marine life, including turtles, nurse sharks and rays, and crystal clear water. It’s a scuba diving paradise! 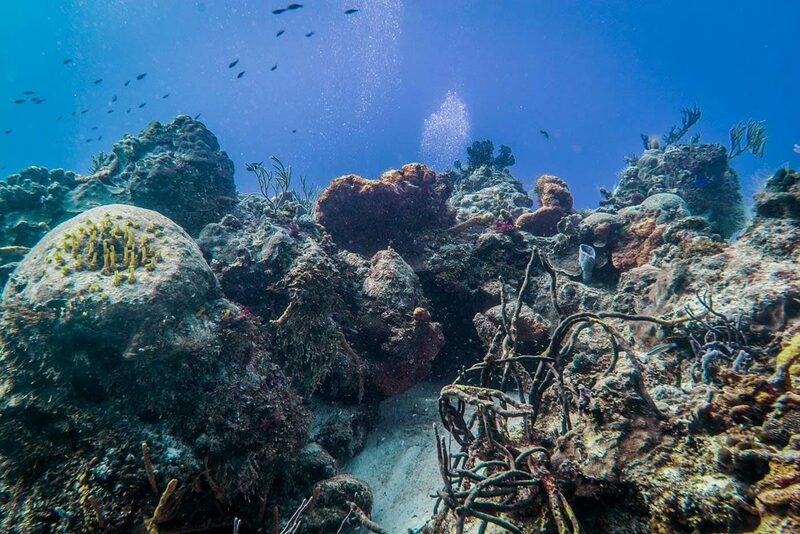 With over 40 dive sites, you’ll be able to enjoy diving in Cozumel no matter your experience level. Beginner divers can enjoy shallow colorful coral sites teeming with life, while the more advanced scuba divers can explore deeper drift dives and caves. Ek Balam is an ancient Mayan site in the state of Yucatan in Mexico. It has an acropolis that you can still climb on, a ball court, and an oval palace – all quite similar to many other ruins in the area. What makes Ek Balam special is the presence of beautiful stucco work that is hard to come by elsewhere. 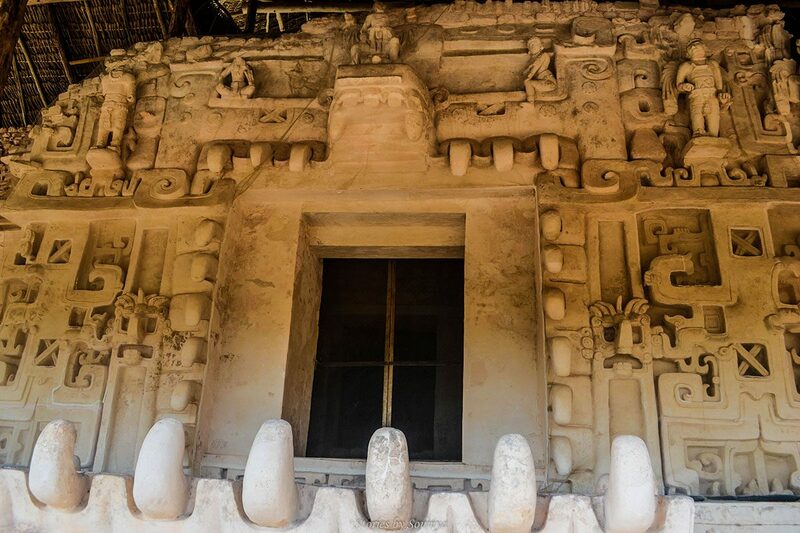 In Ek Balam, under the palapas are preserved intricately carved stucco sculptures from centuries ago. Among these are the figures of winged warriors that have intrigued historians for a long time. 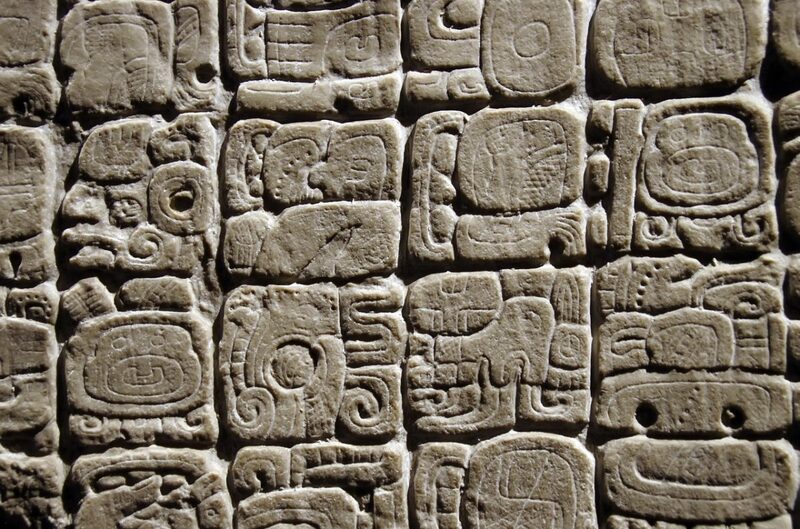 Were they angels, Mayan warriors or the influence of a different culture? Nobody knows. Ek Balam provides you with an excellent opportunity to explore this unique aspect of the Mayan civilization. Mexico is full of archaeological ruins left from the Mayan empire that once ruled. 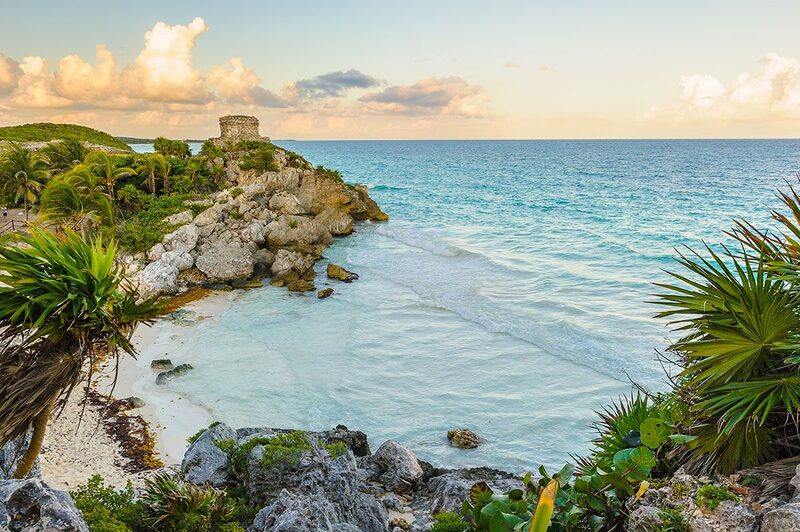 One of the most beautiful ruin sites to visit are those in Tulum, a small beach town on Mexico’s Yucatán Peninsula, just an hour drive from Cancun. What makes the ruins at Tulum special is their location. They are the only Mayan ruins built by the ocean, facing the stunning turquoise waters of the Caribbean Sea. It’s easy to become overheated walking around Mexico’s tropical climate, so bring your swimsuit and head down to the sea for a refreshing dip after exploring the ruins. This Playa Del Carmen Nature Park is full with natural and cultural attractions, including underground rivers and ziplining (it’s the most-visited zipline park in the world, apparently!). There are cultural activities which fuse both Caribbean and Latin culture, Mexican chapels and mansions, a Mayan village and archealogical sites. It’s a must-do day out near Playa del Carmen. This is probably the item on this Mexico bucket list that you’ll want to do once… and never again. Cancun’s nightlife is rowdy and pretty tacky, but it has to be seen to be believed. Most popular is Cocos Bongos, one of the best clubs in the world and a place where famous live acts regularly play. A great eco-tourism destination, Cancun’s Underwater Museum was established to protect the nearby reefs from over-tourism. It’s an alternative attractiont o reefs that needed some time to recover and was built with hardy and durable material. The museum is home to over 500 statues created by Jason deCaires Taylor, a sculptor from the UK. Visitors can choose whether they wish to see the statues on a glass-bottom boat, by snorkelling or getting close up and personal with them by scuba diving. As well as the statues, visitors can expect to see fish and turtles, making this a prime scuba diving destination. 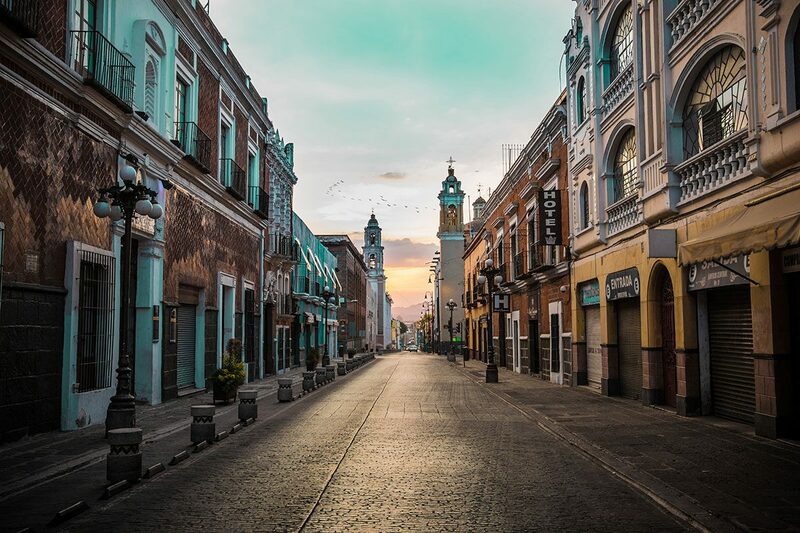 Just admiring the tranquil streets of this Southwestern city is definitely one of the best things to do in Mexico. Tka your time taking it all in; many of the colonial buildings are very nondescript, but look spectacular. There are some fantastic photo opportunities to be had, where you can stand on the cobbles and gaze up at the surrounding mountains. Oaxaca is legendary for its cuisine. However, if you’re vegetarian or vegan, you might be a bit put out by it all. My solution is to take a cooking class. While they aren’t all veggie/ vegan, they do have a main focus on veggies, with the only meat/ animal products involved being cheese and chicken. This makes it very easy to adapt food to suit a harcore herbivore. Dia de los Muertos, or Day of the Dead, is a famous Mexican celebration. 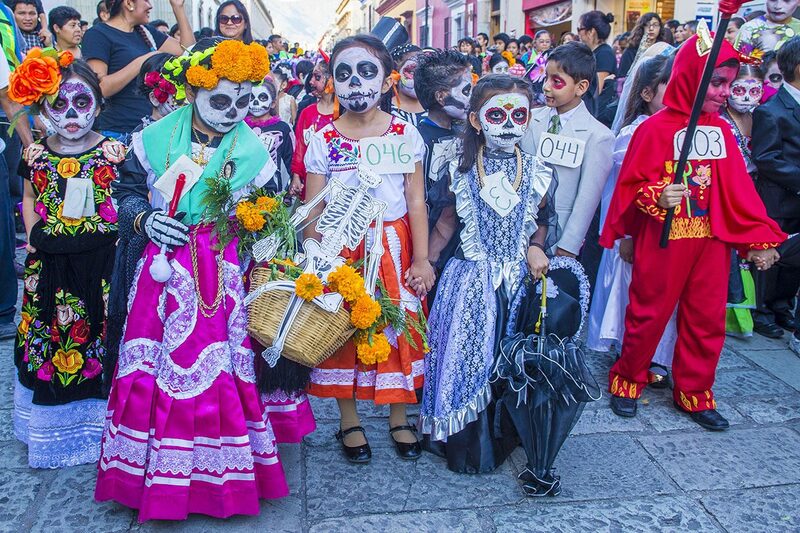 It is held at the start of November every year and one of the best places to celebrate it is in Oaxaca City. Oaxaca is a very traditional city within Mexico, and while this tradition takes place across the whole country, it is especially good in Oaxaca. Enjoy the parades and the festive atmosphere of the streets, admire the altars and maybe even do something special for a deceased loved one. It is also possible to go to the cemeteries and ‘adopt a grave’ – pay respects to someone deceased who hasn’t had their grave decorated and has no visitors. If you do this, obviously, respect the area and the other people in the graveyard, who may be celebrating or grieving. There are plenty of waterfalls in Mexico, but only one frozen waterfall. Hierve el Agua isn’t actually frozen, but it certainly looks like that. Hierve el Agua makes for some great photo opportunities, and there are man-made pools nearby that are great for a swim. It’s also possible to hike around the area, to the top of the waterfalls. Street food in the parking lot and an adventurous journey to get there makes this a worthwhile day trip from Oaxaca City. 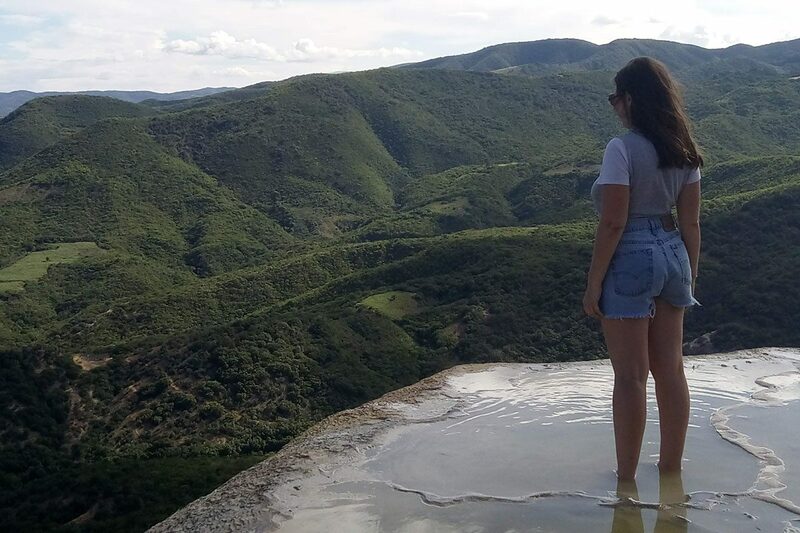 Oaxaca City is beautiful, but getting out into the mountains is a must-do while there; an activity definitely worthy of its spot on this Mexico bucket list. Eight towns in Oaxaca are registered as Pueblos Mancomunados and have an eco-tourism programme in place, where visitors stay with minimum impact and give money back to the local area. As these Pueblos are some of the poorest in the country, this is well needed. You can choose from a DIY hike – taking your own transport up there and arranging a local (Spanish-speaking) guide to show you around, or a fully customisable guided tour. This will include everything over the length of time you need it, as well as an English speaking guide. 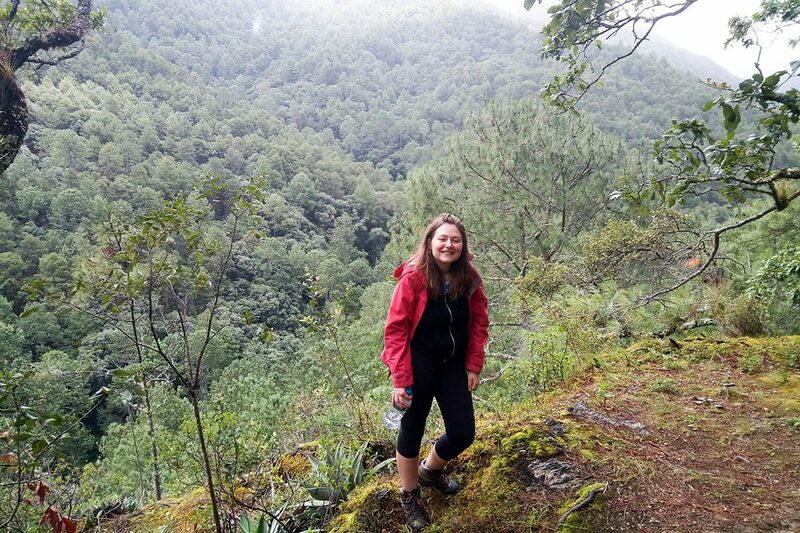 Read my post on hiking in Oaxaca for more information. Puerto Escondido is one of the best beachside destinations in Mexico. It is fairly busy with tourists – but if you come here from the beaches of the Yucatan, you’ll be amazed at how quiet it is! It’s also one of the best surfing destinations in the country. Beginners can take lessons at Playa Manzanillo, where waves are kind and there are instructors aplenty. If you’re already a pro, you can hire a board and check out Playa Zicatela for bigger, tougher waves (don’t surf here unless you really are a pro, I’m not lying when I say bigger and tougher – most people don’t even swim here). 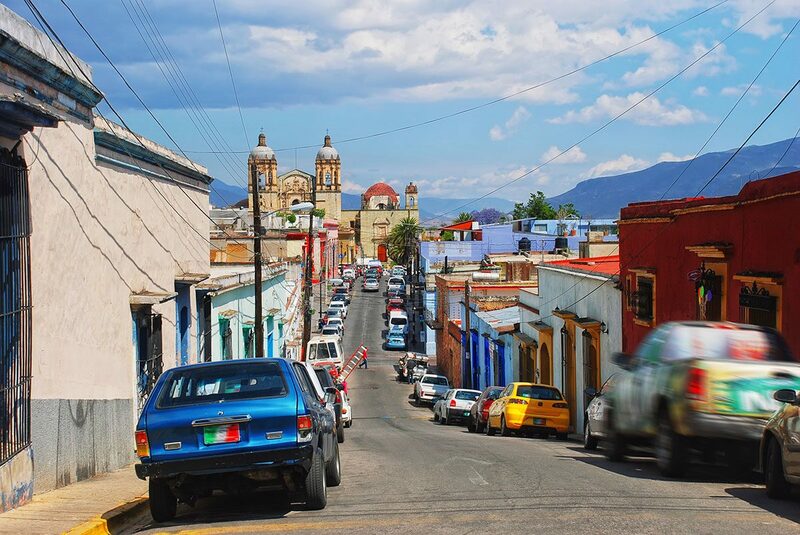 San Jose del Pacifico is nestled in the mountains south of Oaxaca. It’s a beautiful spot, but has got its name for something in particular… mushrooms. And not the kind you put on your pizza, the magic kind. They’re plentiful in the surrounding forests, and eating them is a part of ancient traditions. They’re very much illegal, but you’ll be offered them everywhere in San Jose del Pacifico. Hallucinogenics aren’t ma thing, so I didn’t take them, but SJDP is worth the trip (pardon the pun) even if you’re not going to have mushrooms. There’s an absolutely beautiful view, especially from La Cumbre guesthouse, and plenty of hikes in the local area. 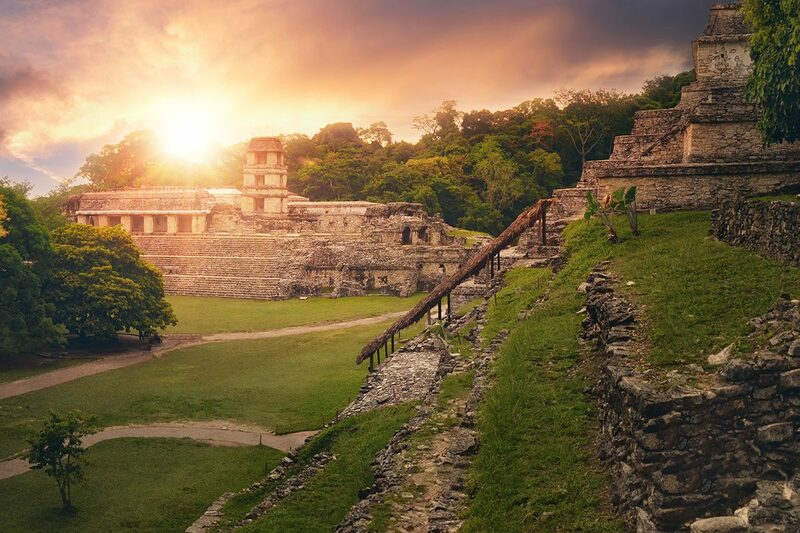 Tucked into the jungle of Chiapas sit the stunning ruins of Palenque, Mexico, the beautiful Mayan city that was abandoned for unknown reasons in the 8th century. This city was smaller than more famous Mayan sites like Chichen Itza or Tikal, and to this day is less popular to visit–but that’s exactly why you should. 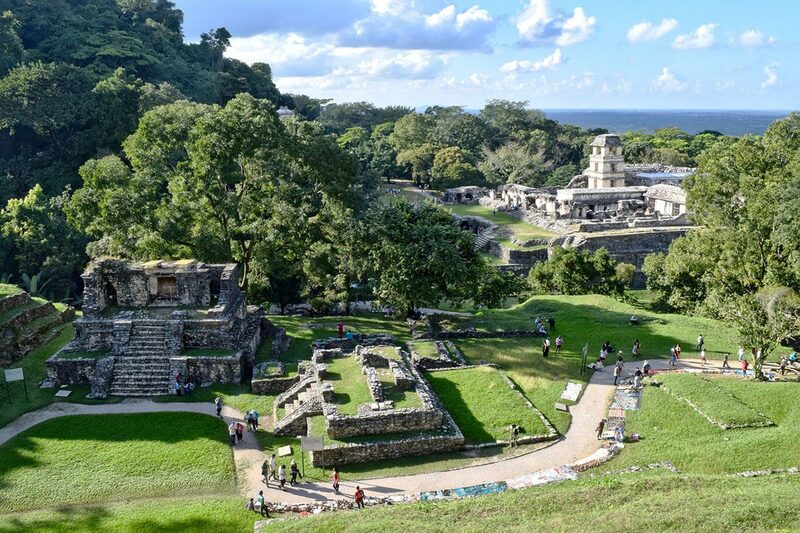 In Palenque, you can wander pass dozens of temples, meander along a palace, stroll along paths through the jungle, and marvel at the fact that while the city as it is seen today is incredibly impressive, archaeologists estimate that they’ve only uncovered 10% of it so far! 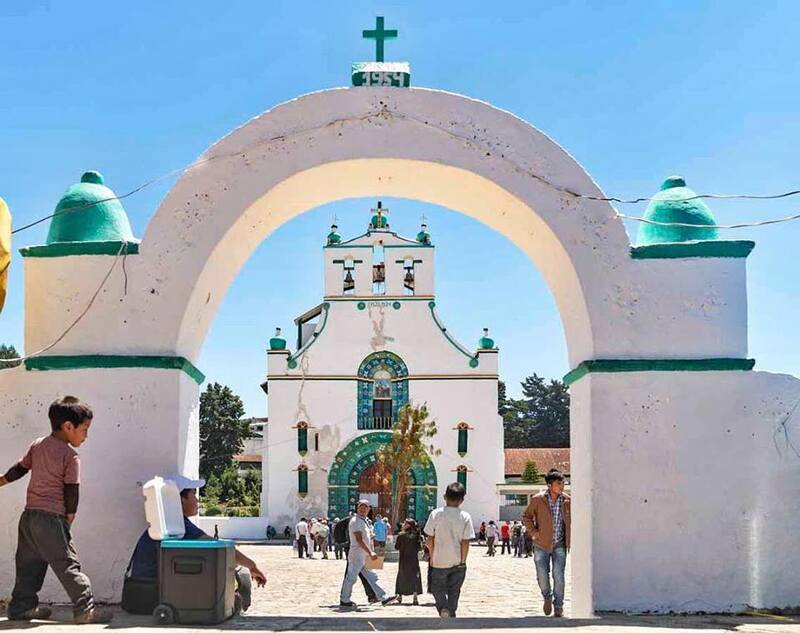 One bucket list destination in Mexico is definitely San Juan Chamula, an indigenous village not far from San Cristobal de las Casas, in Chiapas. This is the perfect place to get a better understanding into the way of life, the culture and the beliefs of the Mayan communities of Mexico. The best way to visit San Juan Chamula is on a guided group tour departing from San Cristobal. The tour usually goes to the market in the main square, and the beautiful, colorful church that dominates the square. Although this is a Catholic church, the local communities practice their rituals inside, in ceremonies that often involve the sacrifice of small animals such as chickens. Only a good guide is able to explain the rational behind the rituals, hence why it’s better not to go independently. Yaxchilan and Bonampak are up there with the best of the best of Mayan Ruins. One of the biggest advantages with these sites is that there are next to no tourists there compared to the likes of Chichen Itza. with monkeys which come down to run havoc and tombs that you can walk inside of. It’s got some fabulously well-preserved sculptures stone lintels above the doorways, so keep an eye out for these. Bonampak is a much smaller site, however head up the steps of the main temple with the three rooms on top. 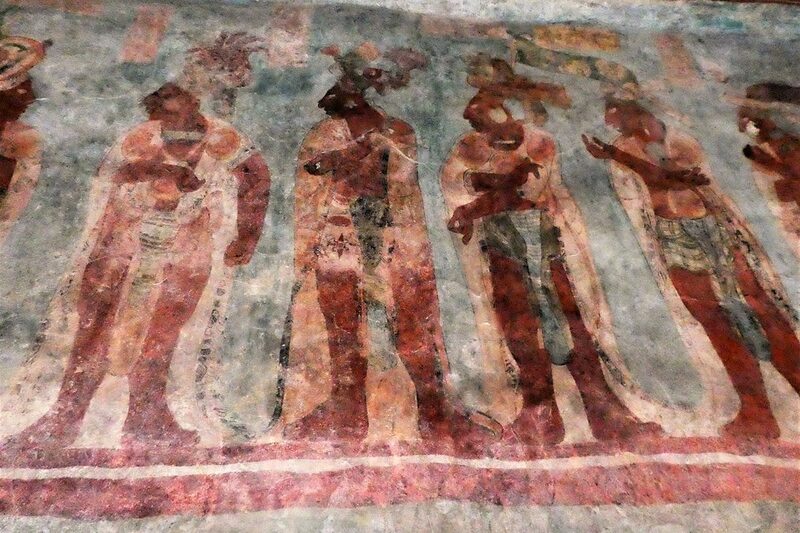 In here you’ll find some of the best preserved Myan Murals in full colour. This has great significance as it’s one of the few places you can see colourful wall murals still, very nearly, intact. 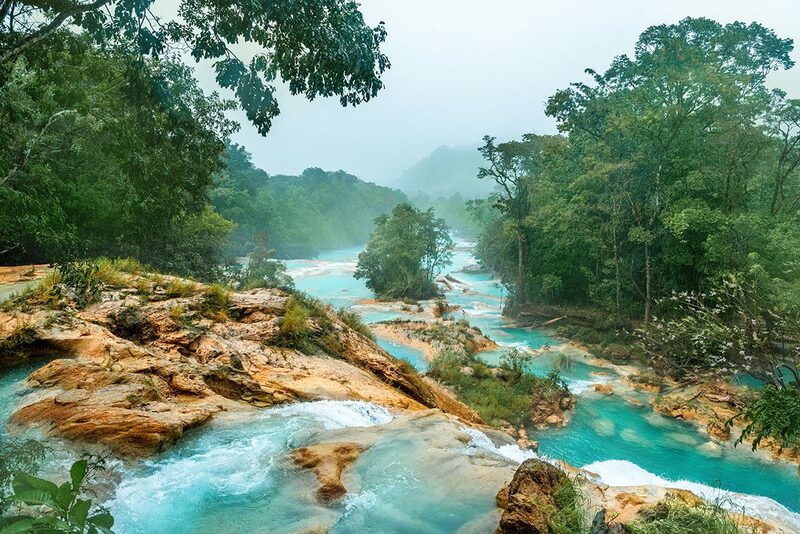 The most famous waterfalls in the country are perhaps Chiapas’ Agua Azul. The indigo waters and lush green vegetation have been the subject of many an Instagram post, but they really are as stunning in real life. Nearby is Misol-Ha, a 35 metre jungle waterfall. Both are a fantastic day out to see some of Mexico’s only rainforest scenery. Many Mexicans can speak very good English; but many others, especially in more regional areas, don’t. But Spanish is a lovely language to learn and in my opinion, is very easy to pick up when you’re hearing it every day. Consider taking some language lessons in Mexico; it’s a great, and cheap, way to learn. You’ll see these kinds of bands, typically made up of four or five people each wearing a hat and carrying a stringed instrument, all over Mexico. They’re Mariachi Bands, and they are symbols of Mexican music and culture. 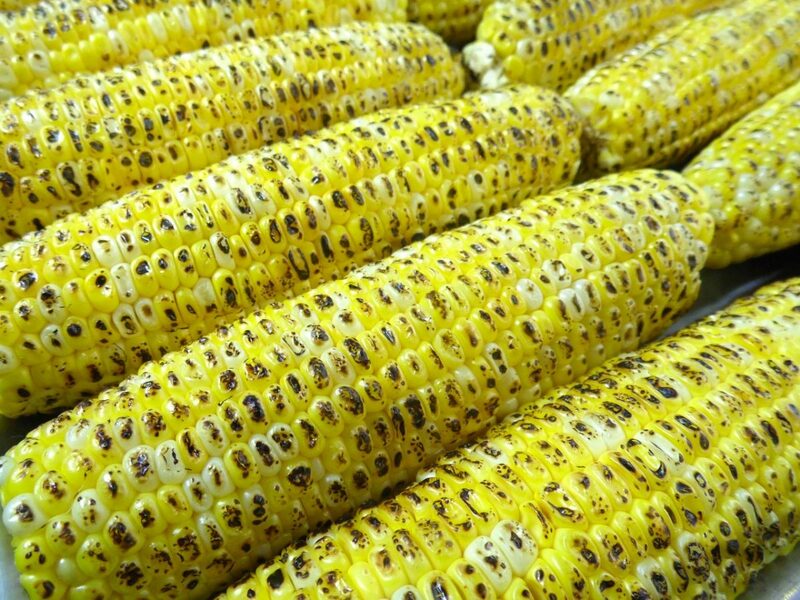 They’re said to originate in Jalisco, in Cocula which is located close to Guadalajara. Mariarchi music intertwines old and new Mexican culture. A band will typically consist of two guitars, one violin and one vihuela which is similar to a guitar but with a rounded back. The costume they wear is called a traje de charro which literally means ‘cowboy costume’. The original Mariachis weren’t cowboys, but the Porfirio Diaz (who was president at the time) wanted them to wear something special so they borrowed clothes from local cowboys! While there’s something special about hearing a Mariachi Band close to where they were established – in Guadalajara – you can listen to them anywhere. 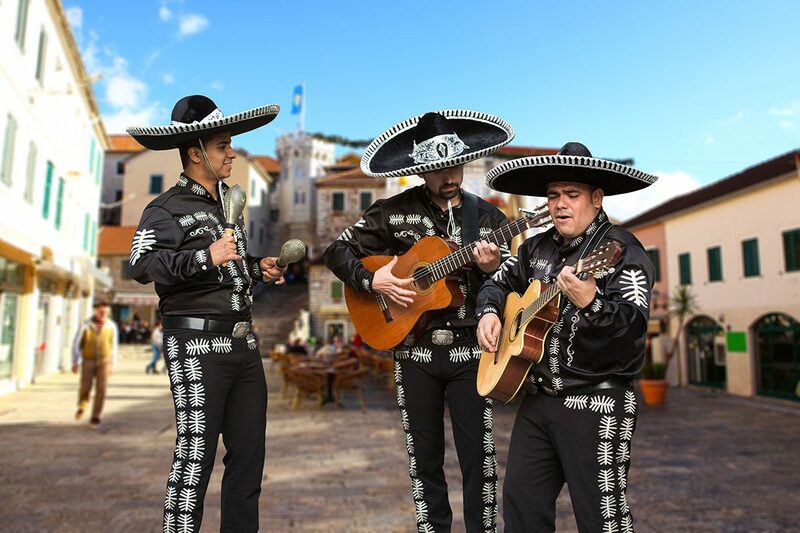 If there is someone in your group celebrating a birthday, hire a Mariachi band to play Las Mañanitas – the most famous Mexican birthday song. Mexico loves its beer – and you’ll quite often find you’re served up three pints at once. It’s not really the country for soberity. I tried to not drink too much here and erm… it didn’t really work. Luckily there are some pretty delicious beers here. 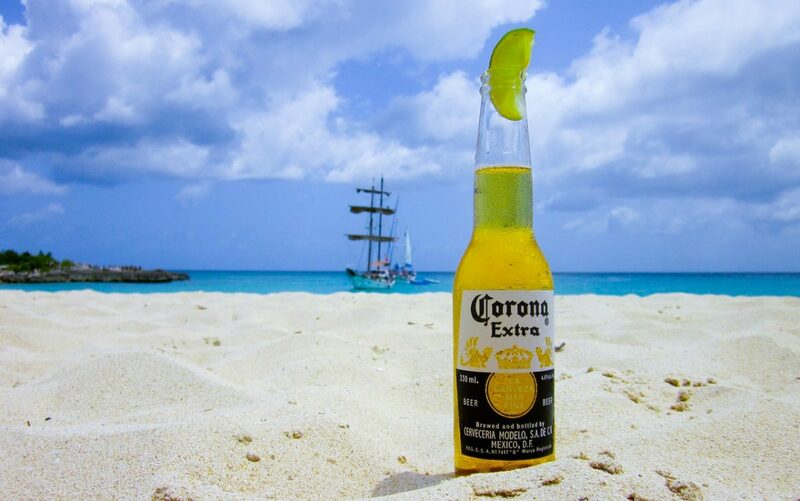 Whether you choose to sip on a corona, enjoy a victoria or neck a , you’ll be spending under $1 for some top quality brew. But Mexico doesn’t just do beer. No no, mezcal and tequila are popular drinks here as well. These spirits are both made from the agave plant – tequila is actually a special mezcal that is made in the tequila region. I think they taste completely different, however – I learnt to love (or tolerate, at least) mezcal whereas I had the worst hangover of my life on tequila (I was throwing up until 8pm the next evening after a heavy night on it). If you’re in Oaxaca, make sure you try the mezcal (if you hang out with any locals, you won’t have a choice in the matter) and if you’re visiting northern Mexico, be sure to head to the town of tequila and have a shot of tequila. 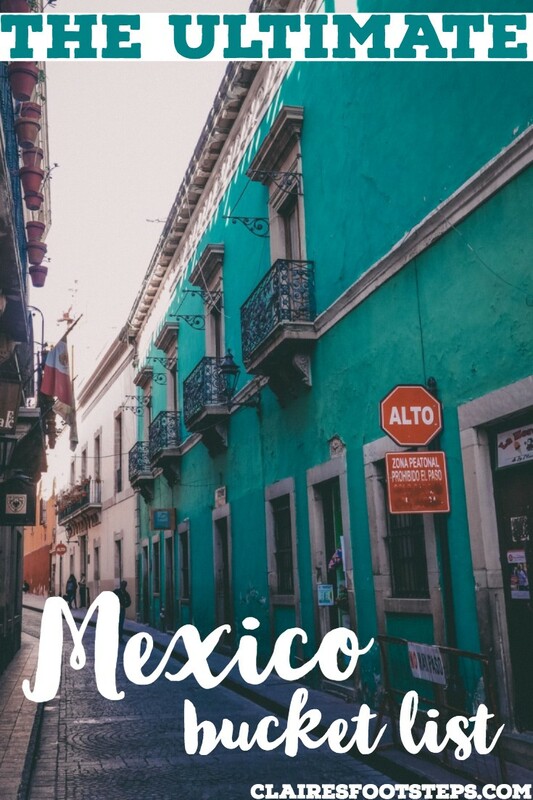 Mexico is known for its street food, and you’ve just gotta grab a few tacos or a torta (basically a Mexican sandwich) while exploring the cities. If you’re vegan, there are some fantastic all-vegan street food stalls in the Mexico City neighbourhoods of Roma and Condesa, or get a torta with veggies and beans (just check that the beans don’t have fat in – say hay manteca en los frijoles?) to confirm. Mexico is one of the best countries in the world to grab a board and take to the waves. Popular surf spots include Oaxaca’s Puerto Escondido, Ensenada in Baja California and Sayulita in Puerto Vallarta. Difficulty ranges from beginner to extreme. The Pueblos Magicos (magic towns) are a collection of Mexican towns and cities that have a special emphasis on cultural heritage and history. Some are designated as Pueblos Magicos because of their rich indigenous heritage, others due to their expertise at producing a certain kind of food. They all have a focus on sustainable tourism. There are 111 Pueblos Magicos, so you’ll be guaranteed to find one to suit you and your trip. Here’s a list of 11 of the best. There are all sorts of dive sites in the tropical country of Mexico, including famous spots in the reefs around Cancun, and lesser known places on the west coast. With thousands of kilometres of coastline and all sorts of marine animals to see, Mexico is a great place to dive or snorkel. Mexico has one of the most extensive ancient histories in the world, and this can be brought to life by exploring its many ruins. Whether you see the Zapotec kingdom of Monte Alban, the Coba Mayan Ruins, or the Aztec ruins of Teotihuacan, be sure to learn a little about the legendary history of the country while here. There are few things more iconically Mexican than the expansive desert, littered only by a few cacti. 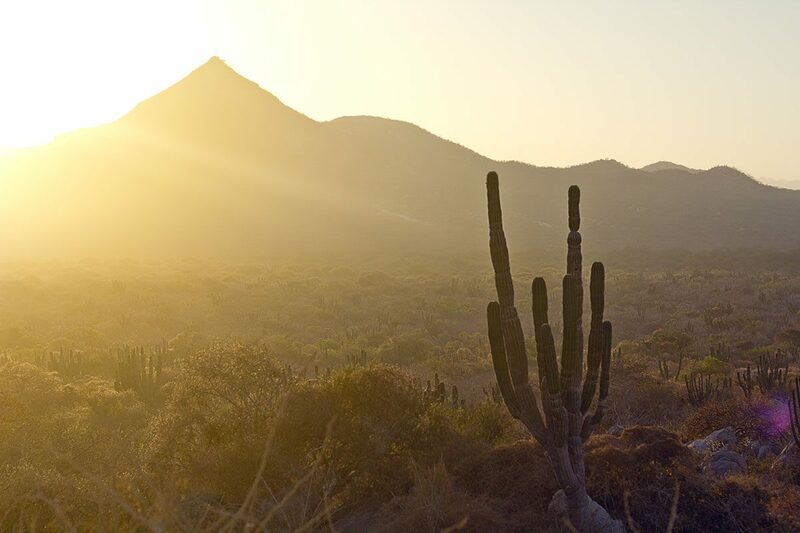 You may experience it by taking the train through Copper Canyon, road tripping around the country, or seeing beach and desert in Baja California – but make sure you add seeing the desert to your Mexican bucket list. Mexico is home to some world-class museums that really help visitors see its diverse and intricate culture and heritage. My top recommendation is the Museum of Anthropology in Mexico City, but there are museums worth checking out in every city. From sipping margaritas and mojitos, to trekking in the mountains, to surfing, to wandering around colonial cities, there are so many amazing things to do in Mexico that you’ll love. Book a trip to Mexico – you’ll love it, I promise! I hope you’ve enjoyed this post – if you have, please share it or follow me on Instagram and Facebook! Diving is the one thing I really want to do, as well as see some of those national parks and ancient ruins, and cities and more & more!!! Do you think it is possible to visit without any knowledge of Spanish or should I get at least basic phrases? There’s so much isn’t there! It’s such a diverse country. People do visit without Spanish and it’s possible if you don’t mind doing tours to visit the attractions, but if you want to do more independent/ off the beaten path travel I would recommend learning a little Spanish. It’s not hard to pick up and is a really lovely language!